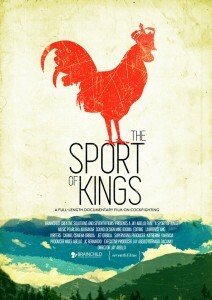 A full-length documentary film on cockfighting. A billion dollar industry. Banned in many states in America. The original king of sports tracing back to thousands of years before the birth of Christ. We’ll take you on a journey into the world of cockfighting—from where it originated and how far it has gone as an international sport phenomenon. We’ll bridge the gap between the United States of America, home of the best breeders in the world and the Philippines, home of the Olympics of cockfighting, the World Slasher Cup in the hopes of understanding what makes a champion breed. We will tell the story from the Philippines where cockfighting is the country’s number one sport and where every town has a legal cockpit or a “gallera”, a 50 billion peso industry where it is estimated roughly 9 million male Filipinos are involved in the sport, and 5 million roosters fight in a year. In the Philippines, cockfighting dates as far back as the 1565 where natives of Butuan were watching cockfights when the Spaniards came for supplies according to Ferdinand Magellan’s chronicler Pigafetta. But interesting enough, every chicken fought in the cockpits here are not of Philippine breed. None. They are all foreign. In fact, almost 99% are from America. This ties the knot so-to-speak between America and the Philippines with regards to the story of cockfighting. This story cannot be told from the Philippines alone and vice versa. It has to be told from both ends. What makes a champion breed and how is it achieved? We are committed to finding the answers to these questions and tell the whole story on the sport of cockfighting.